The #NipClub Holiday Bazaar was awesome! If you were there, you know, but if you weren’t, you missed the opportunity to hang out with friends and shop at some really great stores! But it’s not too late. There’s still lots of time to do holiday shopping, and I think you will get many gift ideas by browsing through the vendors at the NipClub blog post. 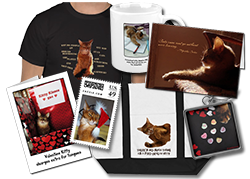 You’ll find gifts for your cats, pretty jewelry, great art and more! The good news is I sold some calendars! The not-so-great news is that they were all bought on Zazzle, which means I still have 11 calendars here that I need to sell! So if you are still thinking of buying one (or more! ), please get them here! I also have copies of my second, highly-acclaimed Dear Sparkle book here, and when you buy it directly from me, you can request a PAWtograph! Or you can also buy a copy from Baby Patches at Nip and Bones, and I can PAWtograph those too. Also, Nip and Bones is actually a lot better with international shipping than I am. By the way, read the reviews on the Nip and Bones site — they are very cool! I do want to mention one cool deal on Zazzle: today only you get 40% off on shirts and mugs with code 12DAILYDEAL6. So this is a great opportunity to get one of my new Destroy T-shirts. The design is made especially for dark colors, and it comes in a bunch of different styles! Check out my mugs too! Sparkle, tell your Mom to make the dog wear that hat! Hi Sparkle! Our Mumsy buys a lot of postcards from Zazzle. We’ll check you out there too. Those star awards are fun, aren’t they? Sparkle, you are the only cat we know who could interest us by talking about the weather. Concats on the award! Sparkle, the green hat does not look good. 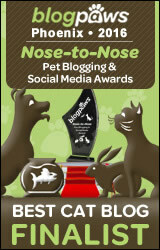 you need to bring the dog in on this one 😉 Concats on the award and on the successful sales. We still need to scoop up one of your calendars…hopefully our mom will get it together before we miss out! Sparkle, add another star to your Blog of the year – we awarded it to you last week too. Concats! What a great post! Yous deserves the Award and concatulations to the cats yous passed it along to and that hat…KILLL IT!!! Oh no! Don’t let the human decorate you for Christmas! Hey, Sparkle! We’re so glad the #Nipclub Bazaar was a great success! But as for that green thing…we have only one thing to say…RUN!!! Well, my mom knows better than to get wearables for me (plus, she says she’d have to shop in the “Husky” department, whatever that’s supposed to mean), but when she went to Petsmart this morning she was very tempted to get a little torti! Thankfully it was way too early for the adoption people to be there. Are you getting ready to be one of Santa’s elves??? Is that an ELF hat? It looks more like a St. Paddy’s Day hat. The calendar Pop bought arrived today. He didn’t buy it on Zazzle. I can’t wait till he gets home and opens it. I know Aunt Pauline and Katie, Jinx and Nikki will love it. Ooooh! That elf hat doesn’t bode well for you, Sparkle. Maybe you can convince Mom to try it on one of your sisfurs instead. Congrats on a successful #NipClub Bazaar! oh cod oh cod oh cod…is that a cat-sized elf hat? Sparkle! That hat is not good enough for your beautiful head. I can’t believe it would even attempt to sit on your head. Ain’t gonna happen. Kisses on your nose Sparkle! You could put a star on your hat Sparkles! Thank you very much for the award Sparkle! I like stars. Maybe they will stop the rain. Oh no, Sparkle. You must come up with some devious plan to ride yourself of that hat! MOL! Oh Sparkle! Thank you so much for the star! Now … how do I do this? We really hope you sell all that stuff, Miss S. And concatulations on your award! We luff your blog too. Tell me that is NOT a kitty hat – Ugh..
Awwww, thank you for the award. It’s nice coming back from blogcation. I’ve missed my pals. Oh, you’re not going to to be forced to wear that hat, are you? We shudder at the thought. Oh dear Sparkle – that hat really is not for you – maybe your Mom could wear it when she goes shopping! Congratulations on your star awards! But uh oh about the hat…well I’m sure you will look fantastic in it though! Glad you sold some of the calendars and that the party was a success. We just don’t have any green papers. Too many cats to feed. Have a great day. Sparkle, I just wanted to say how much I enjoy reading your advice in your pawesome book! Even my Mommy who calls herself a cat expert learned a thing or two 🙂 I wish more humans would take the time to get to know their kitties. We are embarrassed to say what kind of calendars TBT buys… No, not bad ones. Tinkerbelle ones. Oh dear! That hat looks like trouble to us too! Use your authority to make Binga or Boodie wear it. Have a great week! I thought it was always sunny in LA! Congrats on the award, Sparkle and I’ll bet that hat will look super-cute on you.